Tackle your upcoming interior project with a set of quality tools designed specifically for use on soft as well as hard trim pieces. The 5 & 11-Piece Kits feature double ended tools (except for one) and was designed to safely remove door panels, delicate trim strips, dashboard panels as well as aid in window installation. Enter Promo Code TRIM20 at Step #5 during Checkout! 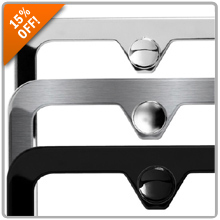 Add a nice touch of perfection to your car with a Stainless Steel Slimline license plate frame by Camisasca. Available in brushed silver, polished silver and black powder coat, each frame is precision-machined! Enter Promo Code CAMI15 at Step #5 during Checkout! 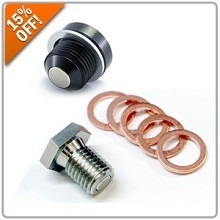 Replace your old, worn out drain plugs for a magnetic drain plug! They allow for quick and easy inspection of your overall engine health and help identify engine problems from foreign debris collected on the magnet. 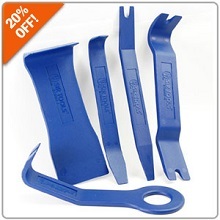 Get them for your Porsche, BMW, Mercedes-Benz, or MINI! Enter Promo Code MAG15 at Step #5 during Checkout!